I’m working on the dream of a young man who shows signs of anger and of having lived a hard life. His dream, which is about how he pushed his mother into a pool of alligators, seems violent and destructive. But as I have said so many times in this Blog, dream symbols are not to be taken literally. The emotional charge they deliver can be misleading. The first goal of any dream is to be remembered, and dreams use graphic, upsetting images to make an impression on the dreamer. It is important to avoid preconceptions. I will ask the dreamer to comment on each of his symbols, using prompts that are as neutral as possible. 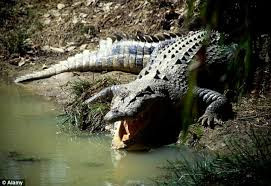 For the alligator symbol, I will say, “Tell me about alligators.” What I am looking for is a reply that will have both a personal association for the dreamer, and will have a metaphoric connotation. The dreamer’s response—as you will read half way down in the next section—is unexpected. But that’s the beauty of this technique. The reply is the dreamer’s, not mine. * Three mothers: It’s weird. Really confusing, and sometimes I don’t even know who I’m supposed to be, because I’m supposed to act different with each one. * Your mother: She lies. She steals. She does underhanded stuff and then blames it all on someone else. I don’t like being around her. She makes me crazy. * Path: It’s like a little walkway where you can move from place to place and see stuff. This one takes you on a kind of tour. * A park in the Everglades: A really interesting place. Wild. Untamed. You never know what might happen. It can be dangerous if you’re not careful or don’t know what you’re doing. * Water: It depends. You can’t live without water. It’s life-sustaining. But it can be filled with danger, too, or polluted or violent. * A little hill: It’s an incline—not too bad—but you have to work to get to the top. Then when you’re there, you have an advantage, because you can see better and further. * Steep sides: You have to be careful so you don’t fall. Especially here, there’s danger down below. * Alligators: Independent, self-reliant. They mind their own business and don’t disturb anything unless they need something. Then they get what they want. In that sense, you can count on them. * Throw my mother to the alligators: It would be a violent way to get her away. I’d be done with the hassle. * Upset with myself: I’m not a violent person and I don’t want anyone to get hurt, so I don’t like those kinds of thoughts. * Push her into the pool of alligators: I don’t even think. It’s like I have no remorse. I don’t get excited either. It’s like doing my chores—taking out the trash—you just do it. * I am ashamed: It’s like I come back to my senses when I wake up and realize that I shouldn’t have done what I just did. It’s like I had the feeling that I lost myself in the dream and did things that I don’t believe in.